Hooray! This is my first post in this blog site and I am glad that my interest in blogging is just got back. Yes! 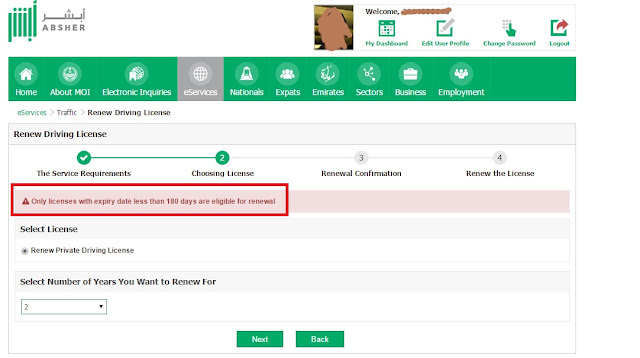 Now, last month I just renewed my driving license here in KSA after it expire in 5years, So I found out to myself that it is very helpful to share my experience to my fellow Expats on how to renew their expiring driver license especially for those my Kababayan non-arabic speaking or knowledgeable. 1st step on how to process your expire driving license is you need to register first yourself on moi.gov.sa (ministry of interior-Absher) by visiting any MOI-Kiosk located on this link: (here) to update your personal profile using fingerprint and after that you will received a SMS text with the details of your user/password login to the website (user name is your iqama no.). 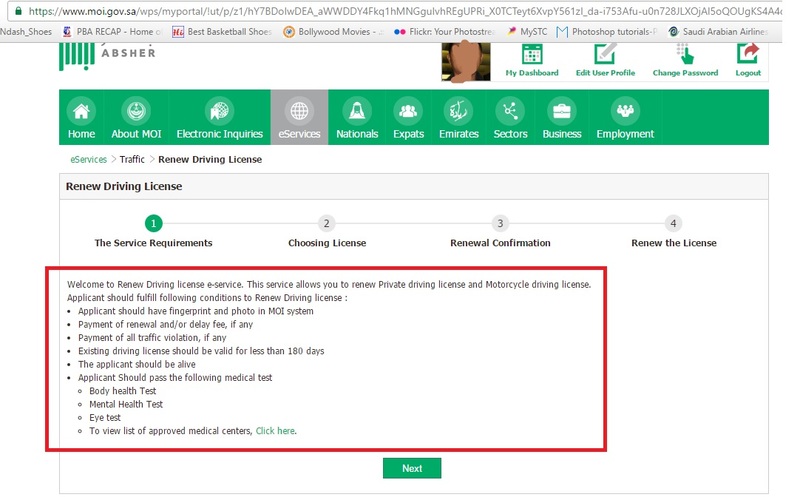 Welcome to Renew Driving license e-service. This service allows you to renew Private driving license and Motorcycle driving license. To view list of approved medical centers, Click here. 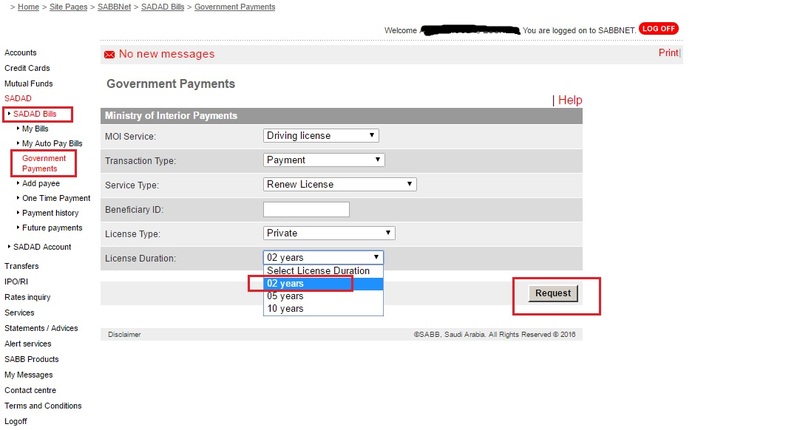 When you click next you have to click Renew Private Driving License and select how many years? After you decide how many years of driving license to expire when you click next they will remind you with this detail: "Only licenses with expiry date less than 180 days are eligible for renewal"
Note: Since I have just renewed my driving license, I was not able to click the next step. 4th step you have to visit any MOI registered clinic to finish your Medical test for driving license. Don't worry it is just a blood and Eye test and then the clinic will forward the result to MOI but take note the check-up is not cover by medical insurance so you must pay 100sr. Note: It is better to bring your passport because the clinic need's your sponsored ID no. 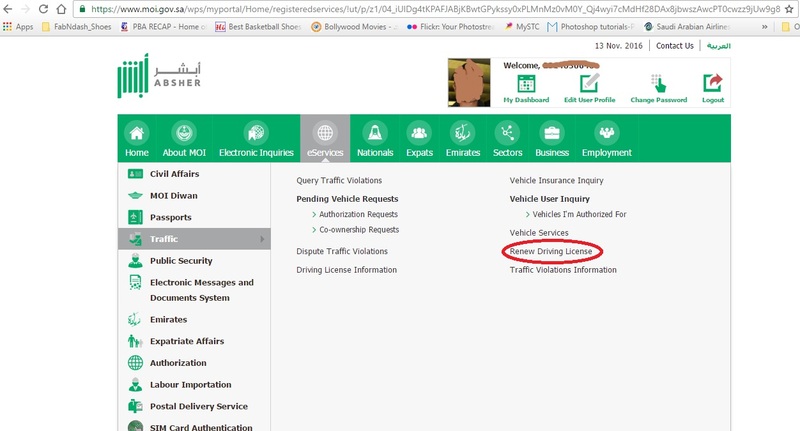 which is in the passport visa page. from my experience it is very hard to do this processing if you are not knowledgeable to communicate in arabic and it's happened to me. 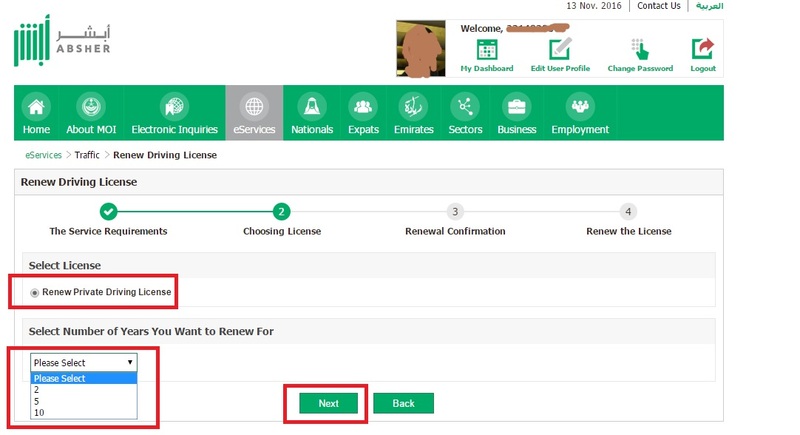 So what I did is to keep asking somebody else on the police station because in police station there is many department and you have find the correct department and give your requirements or otherwise there is fixer outside the police station and they are willing to help you in exchange of 200sr. I went to Exit 6 Muroor Station (Police Station) here in Riyadh and the department for Driving license renewal is in beside of the building near the stair and there, their is a hallway going inside the department and just give your all requirement to the Police officer and in after 5-10minutes you will get you new driving license. Other Muroor Station that you can visit is in Malaz and Naseriyah. so, how do i renew an expired license for more than 5 years? My license got expired in 2013. It is only this year that i have chance to get back to saudi again.